Amazon pay per click is a topic that definitely deserved at least two sessions in our Million Dollar Case Study. It’s one of the most talked about Amazon marketing strategies, and rightly so, as it provides a simple and, if set up correctly, cost effective way to get your products in front of more shoppers. 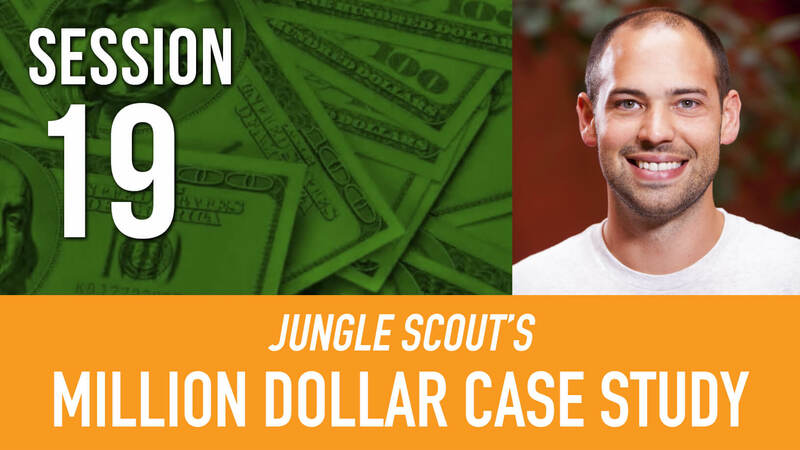 This session is the second PPC installment of this case study, to give you some advanced tips and tricks on optimizing your Amazon PPC campaigns… but not before we update you about our product, Jungle Snugs. Since we are now out of the initial phase launch now so we’ve stopped giving away coupons. Started running an A/B split test with Splitly.com to test our main images – this is the next phase now that we have stopped running promotions; it’s time to optimize our listing. In case you missed it, we covered setting up your Amazon PPC campaigns back in Session #13, with guest speaker Brent Zahradnik. That session covered everything you need to know to set up and launch campaigns, so if you missed it, check that out first. If you’re all caught up, hopefully you are ready to soak up some advanced strategies to transition your campaigns past the launch stage, and optimize them for maximum return on investment. We want to ensure our campaigns are going to be sustainable for the long-term, and profitable, so let’s get to it. Before covering how to reach these goals, Greg gives a quick reminder on some of the parts of PPC that often confuse people. Firstly, match types. You can use three different keyword match types when you bid for keywords for your Amazon PPC campaigns. Broad, Phrase and Exact match types determine how broad or narrow your target audience is. You can choose to target a wider audience by using broad keywords, narrow that down using phrase match, or be as specific as possible with exact match. Generally speaking, broad match is great when you are mining for new keyword ideas, phrase match is when you are trying to reduce spend whilst still allowing for some variation, and exact match is often used for those keywords which you know are very relevant, and which you want to target effectively with a specific maximum bid. Next up is ACoS which is a term specific to Amazon PPC, and not used in other pay per click platforms. This is your Advertising Cost of Sale, which is calculated by dividing your PPC costs by your sales from your PPC. A simple example is if you spend $10 on PPC, and get $100 of sales attributed to those ads, the ACoS is 10%. Greg makes a very important point that you need to figure out at what point you break even considering your PPC costs. Once you understand this, you can figure out how your ads are performing and how to adjust them accordingly. 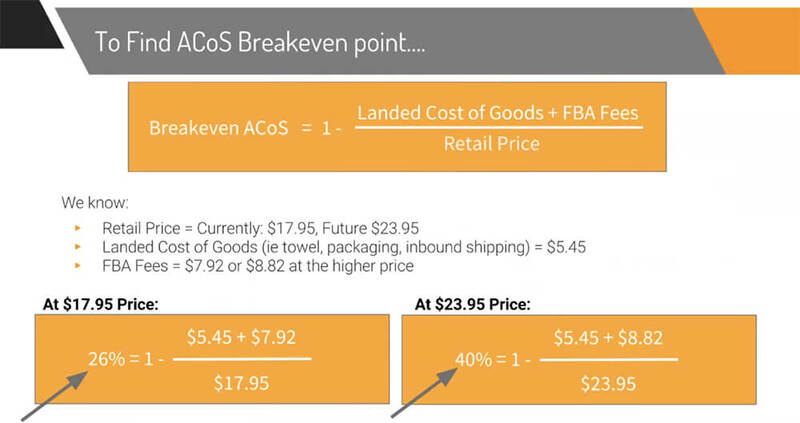 As you can see, with the current retail price at $17.95, our ACoS can be up to 26% and still be profitable or break even. When we increase the price this changes to 40%. This is good for you to figure out because you will be able to see immediately which campaigns, ad groups or keywords have an ACoS higher than the threshold which you break even. Super useful to keep in mind! This report, which can be found under Reports > Advertising Reports in Seller Central, is going to become your PPC optimization best friend! Greg prefers to download this report (which will be a text file) and import it to a fresh Google Sheets document, or you could use Excel if you prefer. The really handy thing about Google Sheets is that it will automatically split up the text into separate columns in the sheet. The “Customer Search Term” is not the keyword that you are targeting but what the actual customer searched for to find your ad – always fun to see! Where you see an asterisk *, under Keyword, this is from your Automatic campaigns, where you do not set keywords but Amazon select them for you. Once you are familiar with this report, you’re winning. From here you can do a whole host of searches, filters and browsing to spot which keywords are performing well, which are wasting advertising spend and even find new keywords to add to your campaigns. Let’s take a look at how to do this and refer back to the three goals we set earlier of reducing spend, ramping up conversions and finding new keywords. In order to do this, we’re going to need to alter bids based on performance. Lowest ACoS – increase bids on keywords that are performing well where possible to increase traffic to your listing. If it isn’t already, consider adding as an exact match type. Highest Spend – ensure that the keywords with the most spend are converting. If you have high spend keywords that also have high ACoS then you need to optimize! Highest Conversions – similar to those with low ACoS, these keywords are amongst your best performers, can you increase the bids or move them into exact match types? You can always add negative keywords to prevent your ads showing for irrelevant terms that you do not want your ads to show, or pay for clicks for. A great example for Jungle Snugs is that Greg noticed is that the keyword “baby wash cloth” had 67 clicks but no sales, and we have spent $118 bucks for these clicks. Although we have a wash cloth as an added bonus, people searching for a wash cloth probably aren’t expecting to find a towel. Therefore, we could add this as a negative keyword in our campaigns to prevent it from being targeted. Tip: You can add negative keywords at campaign level, or ad group level, and you can add them to your automatic campaigns to prevent Amazon from targeting those keywords. Another example Greg covers is people searching for ‘Jungle Snugs’. 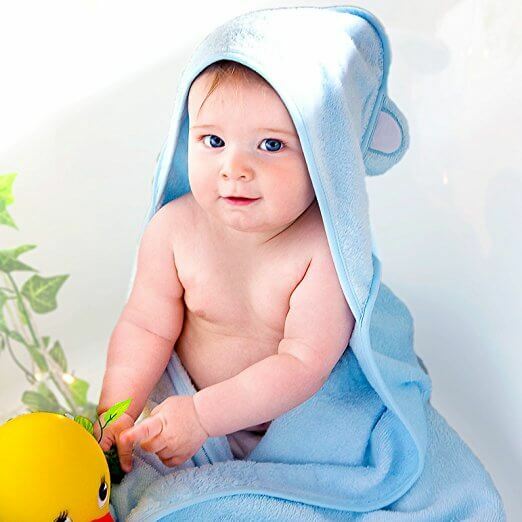 We know that people who are actually searching for a baby hooded towel aren’t aware of the Jungle Snugs brand. It’s safe to assume that people searching for the term Jungle Snugs are people who are following this case study, and then clicking on our sponsored products ads. Tip: You can also add your negative keywords as exact or phrase match. Use phrase match if you want to prevent more variants of that keyword triggering your ads. Greg takes all of the high performing words from automatic campaigns and puts these into targeted manual campaigns. This gives you much more control over your bidding strategy. You can then add those keywords you pull out into manual campaigns as negatives in your automatic campaign. At this point, Greg still wants to keep the automatic campaign running to get some more insights out of Amazon. So rather than pausing it completely, you can just reduce your bids and put less of your budget into this automatic campaign, whilst still allowing it to run and find potential new keyword ideas. Greg mentions an unconfirmed “myth” (read: the experts think this is true, and it probably is) that Amazon prefers exact match. For example, if you are targeting a keyword in broad match and a competitor has the same keyword as exact match, Amazon will show preference for an ad for the exact match keyword. In any case, even if this is not true, it is something to aim towards. Mostly because exact match keywords allow you to have more control of your bids and really hone in on the keywords that are important to you and which convert well. You can also start to isolate profitable keywords to their own independent ad groups for an even more granular approach. This really helps with your campaign management moving forward, as it’s really easy to identify those high-flying keywords, check your reports and adjust bids accordingly. No Amazon PPC strategy is complete without some growth. In order to keep moving your campaigns forward, it’s important to understand how to navigate the search terms report to find new keyword opportunities, and also spot which keywords are performing or underperforming. Greg’s method to easily find those keywords is to find out what his customers are searching for and actually purchasing. To do this you can filter by ‘product sales’, and take a look at all of the search terms that have already had some sales. From here, you can pull out all of these keywords and add to a highly targeted exact match campaign. You can repeat this same process with those search terms that have a high click through ratio. Greg filters his report for all search terms that have a CTR of over 1%, and then adds all of these keywords to a targeted campaign. You can use our new tool, Keyword Scout, in the Web App to find new keywords! Why? Because different search terms perform better with different match types. After these campaigns have ran for a while, we will be able to check the reports and see how these keywords perform under different match types, and adjust accordingly. If you want to do some further keyword research, skip back to Session #11 for more detailed insights on how to do this and which tools you can use. Greg makes an excellent point in the Q&A to not be discouraged if you don’t have many PPC sales, especially if your campaigns have not been running for very long. It actually takes Amazon 24-48 hours to attribute your sales to your campaign in the Seller Central reports. You really need to run these for some time to get some attributable sales. Additionally, Amazon will also attribute sales to your PPC campaigns for up to 30 days after a shopper clicks on your ad. So even after a 7 day period you may not be seeing the full picture. Greg recommends running your automatic campaigns for at least a week to get you started, in order to generate enough data to move forward. From there, you can start to build out your manual campaigns and optimize as per the advice in this post. If you automatic campaigns are draining budget, you can reduce the bids! It’s important to keep on top of your Amazon pay per click campaigns to ensure they aren’t just burning through money on clicks that aren’t bring in sales. Ideally, you want to spend some time each week carrying out some of the tips shared in this session, and gradually optimizing your campaigns as you go. If you have any questions about the content of this Million Dollar Case Study session, please drop them in the comments below! After taking a well deserved week off (for July the 4th holiday), the case study returned with a bang to cover something totally new to the Jungle Scout blog: AMS (Amazon Marketing Services). In this session, Greg covers how you can utilize AMS to show other types of ads for your product listings. We have examples from some banner ads we have been running for Jungle Snugs and more. Check out the first installment on AMS here! Just a pinch complicated don’t you think? I have a building toy that i recently launched – similar to Tinker Toys. I created a campaign ad with several keywords but it seem like only one keyword is getting impressions. I added “stem building toy”, “educational building toys”, “straw building toys”, etc… all in the same campaign. Only “stem…” gets any impressions. Do certain keywords drown out other in the same campaign? Is it because they all inclde “toy”? Did i sue the wrong Match Type? I have set my bid to $5 for all of them and i still don’t get impressions on the not “stem…” keywords. Do i need seperate campaigns? Did you check out what Keyword Scout says? So you basically just have 2 ad groups in one campaign. One ad group for auto key words and one ad group for exact match. You skip broad and phrase match keywords? Thank you. I usually just do exact and broad. Do you create different ad sets for each manual keyword. For example do you have an ad set for the same keyword in Broad, phrase, and exact and how much budget do you set for each ad set? Thank you. It depends on how a keyword is performing. I usually use my reports to find good exact keyword matches. So if a specific keyword was doing well in an auto campaign, I might turn it into its own exact keyword. But I’ll keep all those keywords in the same campaign. If that makes sense? I had a question – Greg reduced his bid on the auto campaign, since the high ACOS wasn’t sustainable. How is that, vs reducing the overall budget on the auto campaign ? Is there a benefit to one vs the other, in your experience ? Let’s give a hyptothetical situation. So let’s say that you’ve got an auto campaign set up with a $25 budget and you’re bidding $1 per click. Your conversion rate is roughly 10%, so for every $10 you spend in ads, you’re making one sale. You see that your ACoS is 40%. A little high. You’d like to get it down to 25%, or $6.25. Assuming that your conversion rate will stay the same, you reduce your cost per click down to $0.63. That way, when you get ten clicks, you’re only spending $6.25 versus the $10 you previous were, and your ACoS is now 25%. You haven’t changed your budget, so you’re making 4 sales per day from ads (versus the 2.5 you were making when ACoS was 40%). If you adjust your budget down, your ACoS doesn’t change, because your CPC is still the same. So if you go down to say, $15, you’d only make 1.5 sales since conversion and cost per click is unchanged. Yes, makes sense! In essence, with a 63 cent CpC, vs $1, I’m getting more clicks for a $25 budget, and thus more sales. So when I reduce the bid, I lose out on the keywords that cost higher that give me sales, but it also reduces my spend for expensive keywords that werent’ giving me anything. On the other hand, if I reduce my budget but keep the max bid at $1, I win access to the entire range of keywords, I just run out of money quicker in the day, so I could lose more sales because I’m out of budget. Here’s the strategy that I use that’s done pretty well over time. I first start with an auto campaign and run that for about a week, bidding pretty high… usually $1.50 to $2.00 to start. Note: most of my products sell for $25+. Then, I take my search terms report and take all the keywords that converted higher than 10% and copy and paste those into a manual campaign. My bids for the manual campaign are high, too, and sometimes I’ll even start them with Bid+. After a week of that, I create another search term report. I’ll then copy and paste the new terms from auto into the manual again (there’ll probably be some overlap) and the new terms from manual into the manual campaign but with “exact” matches. I’ll then start cutting out keywords that won’t convert, usually pausing anything that’s gotten more than 20 clicks but didn’t do any sales. I’ll also cut out anything that’s gotten 20 clicks and has an ACoS of 70% or higher. Anything under 70%, I’ll use Amazon’s suggested bids to reduce/raise prices accordingly. For stuff that converts super easy–under 10% ACoS–sometimes I’ll jack up the keyword prices to as high as $3.00. Usually, the clicks will get nowhere close to that, but I want to make sure I dominate that keyword. I’ll keep up this pattern for, well… forever! Haha! Some of my oldest products have had thousands of clicks and have barely changed. Over time, some get dropped, and some new ones appear. It’s a slow process, but it’s way better to do it methodically then go in all gung-ho and spend too much/too little. Budget doesn’t matter if you’re spending too much in ads. It’s all about profitability. I recommend using Fetcher to see your actual costs and profits and make your decisions based on actual metrics. Consider this… you can reduce your budget to $10, but if you’re spending all $10 and not making a sale, then it’s not worth it. Versus spending $100 on your ad budget, spending it all, and you’ve gotten 20 sales out of it. My first product has two color variations, and I started out with an auto campaign for each color. I ran the reports based on your inputs, and both colors had ~10 high conversion sales keywords that were the same, but there were ~5 keywords that highly converted for one color, and got no sales for the other color. Also, the same color had 2x the sales. I was surprised that some keywords didn’t convert for both colors. So I’m thinking to run a manual campaign for each color variation with their respective high conversion keywords. (and removing those same keywords from each auto campaign). But then I still have 10 high conversion keywords in common across 2 newly created manual campaigns. – Wouldn’t I still be bidding against myself for those 10 keywords ? On the other hand, I noticed ~49m of the video, Greg loaded up the same 999 keywords into 3 different manual color campaigns, so maybe there isn’t cannibalization ? – Or am I overanalysing this, and just combine both colors into one manual campaign ? Yes, the variations would go up against each other and compete as normal. And they’re going to rank for different things and have different degrees of relevancy. By putting out so many “feelers” into the A9 search engine, you’ll cast a wider net, which will create sales synergy for you. So, if for example someone doesn’t want a red garlic press, they can click through and see that you also offer a blue one, which helps ups conversions. Don’t worry about overanalysis. We all get a little AP! My recommendation is to start slow. Run your campaign with just a small budget… maybe $25 per day or so, and then check your results after 7 days. Then make adjustments from there. After the initial broad keyword PPC, I get a ton of “Customer Search Terms” of specific ASINs. I heard Greg explain that these show up because customers clicked on my image from their page, but my question is, should these ASINs be omitted when starting a new Exact Keyword campaign? I think you are right… for an exact keyword campaign, I don’t think your ad would show on a competitors product listing. Unless, perhaps, the shopper did in fact use that exact term to find that listing. I’m not 100% certain on that one though. However, I would advise that running some phrase and broad match campaigns is still beneficial. 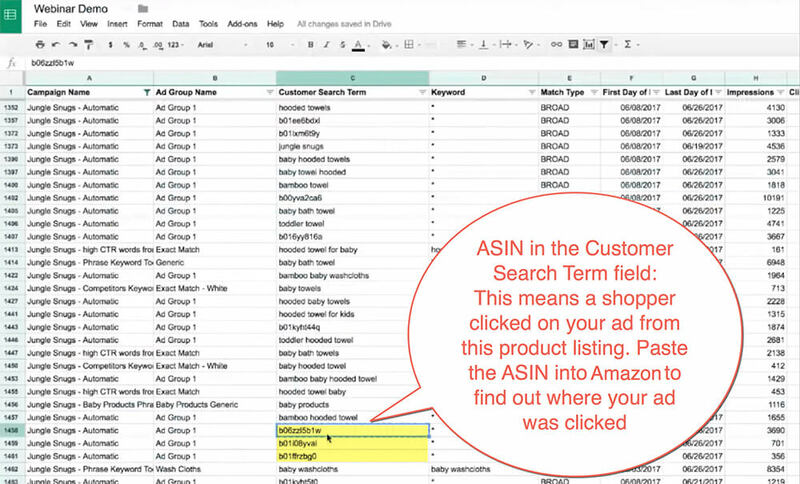 When you see an ASIN as the user search term it means that a shopper saw your product ad on a competitors listing in the “Sponsored products related to this item” section. So this means they decided to visit your listing (thus moving away from the competitors listing). At 37:55 you added “washcloth” to your negative keywords in the automatic campaign. I noticed that you added it as a phrase match. One thing I worry about is the situation where the customer searches, for example, “baby towel and washcloth”, would “washcloth” as a negative keyword phrase match block that search? When is it recommended to use phrase match vs. exact match when adding negative keywords? Great question! Technically yes you are correct, adding “washcloth” as a phrase match negative may block some longer tail searches like “baby towel and washcloth”. We were aiming to get more volume from relevant keywords, and also prevent our ads showing for less relevant keywords which we know didn’t perform very well (ie, including washcloth). Also we know from our keyword research that the term “baby towel and washcloth” gets little to no search volumes. Having said that, another tactic could be to add a host of washcloth keywords as exact negative match, in order to allow for our ads to fire for terms like “baby towel and washcloth”. It just depends on what your goals and objectives are, and how narrowly you want to define what you spend your advertising budget on. Thank you Greg – excellent over the shoulder stuff and very helpful. I’m trying to figure out how to use the Search Term Report. For manual campaigns all the info is available, but for the auto campaign as you mentioned it just puts an asterisk instead of showing the KW. My question is how can we know what the KW is that the customer typed in if there is always just an asterisk there instead of showing what the KW. Or am I missing something? With an Auto campaign, you can’t see which keyword Amazon has decided to bid on that triggered the ad, but you can still see what the customer typed in, just review the “customer search term” column. So you can still effectively pull out keywords from the customer search terms from your Auto campaigns and put them into Manual campaigns. 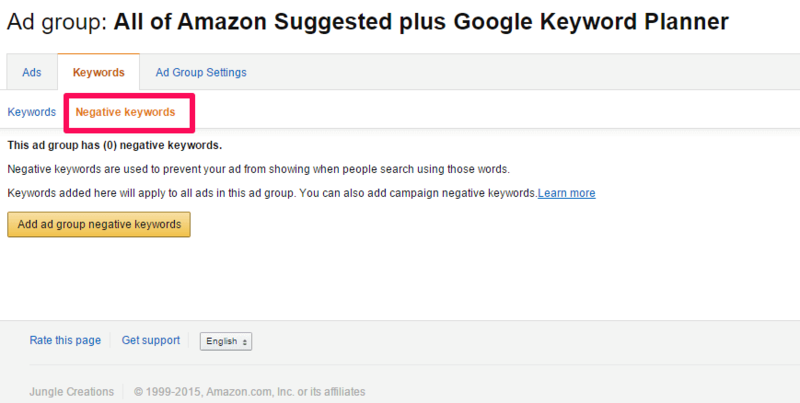 You just can’t see which keyword or match type Amazon used. Again a detailed explanation on PPC that gives good tools to use and not fear it. You could take either approach. Putting them all into campaigns is one sure-fire way to figure out whether they perform well for your products. If they are all relevant keywords which I had personally spent the time researching, I would go for it. Also consider that you will want to set aside some extra ‘budget’ to test them out in new campaigns, because you don’t want to pause or reduce any campaigns which are already running successfully. Great content as always. Thanks to you I already have a live listing selling on amazon. Could you tell us how many coupons you gave away to date, to reach the position you are in now? Just to have an idea of what it takes. And what advice would you give to someone who can’t invest as aggressively in ppc? The daily budgets you have in the Jungle Snugs campaigns are out of reach for many people at the beginning. can you please share your photography requirements that you wrote to the photostudio. It will be helpful to me understand how you transform an idea into reality. I have done this in past with great results and also not so great results. So I would like to know how you pros doing it. Thanks for an amazing case study and all the free information. The biggest fan of jungle scout here. We have a good relationship with the company already so we sent over some simple requirements including a list of the shots we wanted and some examples for inspiration. There’s some tips on hiring product photographers in this article over on the Splitly blog too! If you are using a new photographer, my advice would be to be as detailed as possible about your requirements.